â€œThe Martha Stewart of weed bakingâ€ (New York magazine) offers a beautifully photographed, gourmet guide to baking with marijuana. From her Sweet Mary Jane bakery in Boulder, Colorado, Karin Lazarus has made it her mission to bring flavor, passion and innovation to a cuisine previously best known for pot brownies. Using premium medicinal marijuana, good-quality chocolates, real butter, and other natural whole foods and adventurous ingredients, Lazarus has won legions of loyal fans with sophisticated treats like Smashing Pumpkin White Chocolate-Pumpkin Bars, Sweet Temptation Mango Sorbet, and Chocolate Almond Delights. 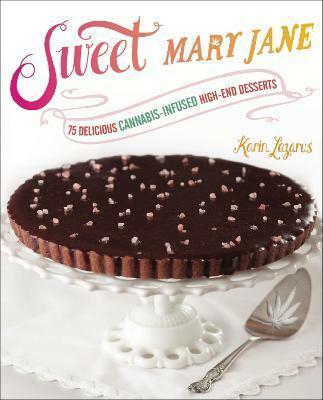 And now, Lazarus is ready to bring information about her baking techniques and her recipes to the nation.Â With the medicinal use of marijuana now legal in 22 states and recreational use legal in 2, Sweet Mary Jane is the go-to book for baking with weed. With beautiful photography throughout, Sweet Mary Jane caters to health-conscious bakers who want to know how weed can be incorporated into baked goods and who would rather ingest than smoke; millenials throwing dinner parties ; foodies using top of the line marijuana to bake with their high-end chocolate; and people with serious medical conditions who want [delicious] relief from their symptoms. Lazarus provides a simple primer on making essential staples like cannabis-infused butter, cannabis-infused coconut oil, and THC-infused sugar; a chapter on dosing and how to make sure your edible treat is the exact potency you want; and, of course, 75 delectable and deliciously-infused recipes from Coloradoâ€™s most beloved bakery â€“ recipes that can be made with or without the infusion of marijuana.